Moritz Oppenheim’s The Return of the Volunteer from the Wars of Liberation to His Family Still Living in Accordance with Old Customs, showing Jews fought too. The emancipation of Europe’s Jews in the 19th century freed them to pursue avocations and professions previously closed to them, including art. That in turn, according to cultural historian Richard I. Cohen, provided an opportunity to put on canvas their struggles with their own Jewish identities. Many of these artists used — and many of today’s artists continue to use — their talents to depict “how we can live in the modern world and keep tradition,” said Cohen, the Paulette and Claude Kelman Chair in French Jewry Studies at The Hebrew University in Jerusalem. Cohen spoke April 1 at the Douglass College Center in New Brunswick during the annual Ruth Ellen Steinman and Edward J. Bloustein Memorial Lecture. The event was cosponsored by Rutgers University’s Allen and Joan Bildner Center for the Study of Jewish Life and its Edward J. Bloustein School of Planning and Public Policy. 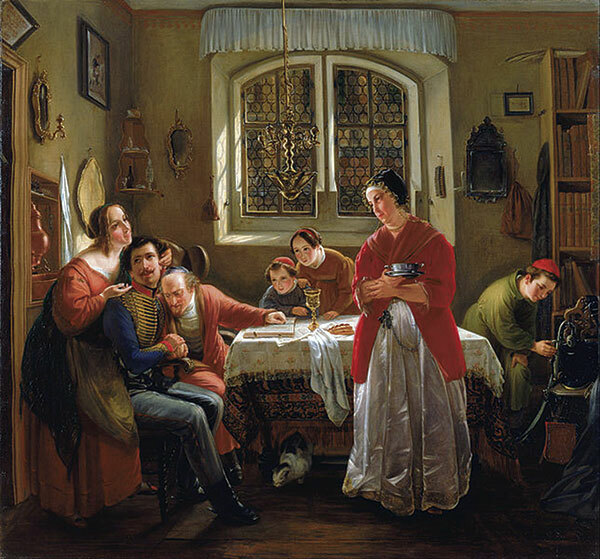 Cohen cited Moritz Oppenheim’s 1856 painting Lavater and Lessing Visit Moses Mendelssohn, which depicts an imagined meeting between Mendelssohn, the renowned Jewish and secular scholar; Gotthold Ephraim Lessing, a German writer and philosopher; and Swiss theologian Johann Kaspar Lavater. In their actual meetings, Lavater failed in his attempts to convince Mendelssohn to convert to Christianity. In the painting, Mendelssohn is shown as a proud Jew, wearing a kipa. “Oppenheim wants us to see Mendelssohn as a strong and assertive Jew,” said Cohen, former head of the Department of Jewish History and Contemporary Jewry at Hebrew U. and currently a visiting fellow at the Katz Center for Advanced Judaic Studies at University of Pennsylvania. 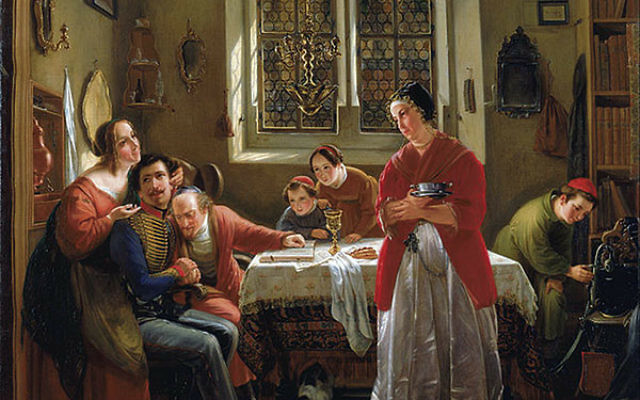 In Oppenheim’s The Return of the Volunteer from the Wars of Liberation to His Family Still Living in Accordance with Old Customs, a wounded Prussian soldier in full uniform returns from the Napoleonic wars to his observant family as they are celebrating Shabbat. Maurycy Gottlieb became one of the first artists to gain renown as both a Jewish and Polish artist. Best known for his 1878 painting of a traditional Yom Kippur scene, he also depicted Polish history and scenes from the New Testament. Cohen pointed out that bringing Jesus into his work — a clearly Jewish Jesus with a universal message — Gottlieb depicted the “struggle” between the artist’s Jewish identity and the world around him. That impulse is also seen in a 1999 photograph by Israeli Adi Nes, who restaged Leonardo Da Vinci’s Last Supper with male IDF soldiers standing in for Jesus and his disciples. “This could very well be their last supper,” Cohen noted.